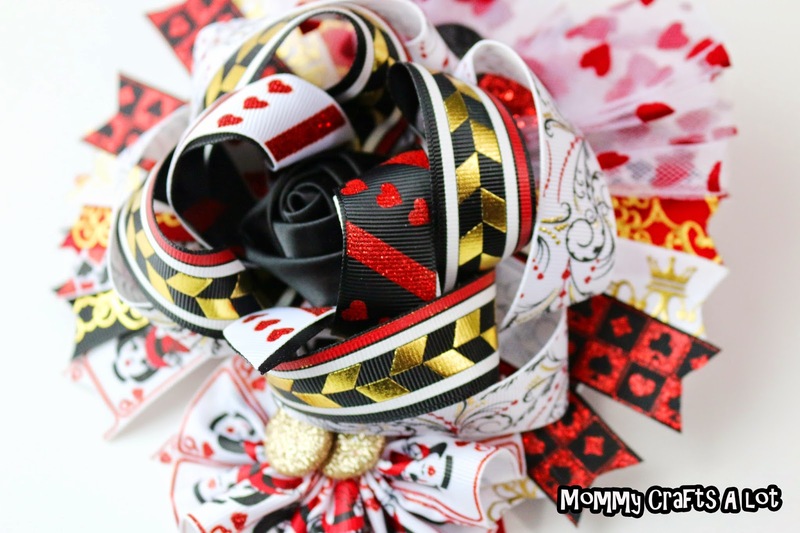 I am in love with the Queen of Hearts ribbon collection by Ribbonology. I know I have mentioned it before ;) It simply is perfect in every way. I thought I would start something NEW here on the blog. I'll post some design ideas for ya. Of course, if you love this ribbon you can always order some of your own at Ribbonology. First let me show you the final product :) I kind of like it. A LOT! Aren't the ribbons just amazing? I used two surround a bows with 7/8 inch ribbon. Surround a bow tutorials can be found HERE on my youtube channel. Each strip measures 7 inches and I used a total of 12 strips. Tutorial for the spikes is right HERE. I also used a Twister bow for my topper (I went a little OLD SCHOOL!) Find the tutorial here. Now we are ready to start assembling the parts :) Grab your glue gun. We are going to start with the pinwheel base. Your spikes will go on top. (So, add a bit of glue and press the spikes on top of your base bow. You can then go around the pieces with some embroidery floss for more stability *optional*. Now add a bit more glue and add your BIGGER surround a bow on top of the spikes. Now we are going to add our Twister topper. As you can see above after I added my Twister Topper I went ahead and added the bow to it's clip with 3/8" ribbon. I always wrap my 3/8" ribbon around twice. Now I'm going to add that tulle puff I made earlier and the ribbon flower as EXTRA embellishment. I'm putting my tulle puff right at the top middle of this bow. Just press the felt (with hot glue) to the top spikes and press down. Next I am adding that ribbon flower piece. I'm going to add it to the bottom right corner (or LOOP) right behind the loop with a little glue. Remember the sequin/glittery buttons? Now I'm just going to add them around my bow *with glue. Bam! That's what's up :) This bow is complete. It measures right at 5 1/2-6 inches wide *Like I said, BIG BOW! 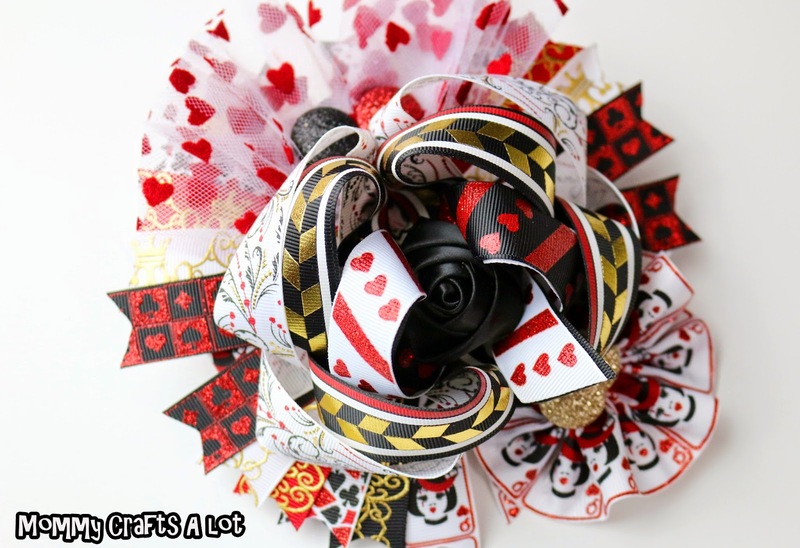 Now who's ready to go buy some Queen of Hearts ribbon? Find her on facebook as well, Ribbonology. Don't forget to click on all the tutorial links above. If you make a bow using these ribbons please visit me on facebook and post your creation!